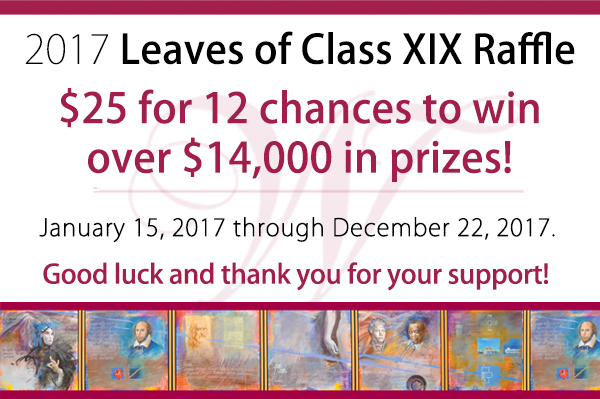 Leaves of Class XIX – November! Comments Off on Leaves of Class XIX – November! Congratulations to John Norcross of Clarks Summit who won $250 cash courtesy of Kratz Auto Supply; a drone, courtesy of Brian McHugh; a green plaid Southern Proper tie from Burlap and Bourbon; a lighted Christmas village, Longaberger ornament, and crystal bear courtesy of Charlene Reese; A beehive sugar bowl courtesy of Hudson’s General Store, two bottles of Royal Crown whiskey in a Longaberger basket courtesy of Charles Kratz and Charlene Reese, and two logo t-shirts and a baseball from the Scranton/Wilkes-Barre RailRiders. John also won gift cards/certificates to: Amazon ($60 gift card); Boscov’s ($50 gift card); Debbie’s Flower Boutique, Inc. ($50 gift card toward a silk arrangement); Live with It by Lora Hobbs ($50 gift certificate); Nada & Co. ($50 gift certificate); The Settlers Inn at Bingham Park ($50 gift certificate from ); Stirna’s Restaurant ($25 gift certificate); Lucky’s Sporthouse Kitchen & Cocktails from Metz Culinary Management ($20 gift card), and Abe’s Deli ($10 gift certificate).